ARYAN BLOOD play 3 tracks (one intro and 2 short songs) on this split. Its performance is very good and recorded on a 4 analogue track wich gives a raw sound that fits very well to its compositions. Of course we feel the influence of Satanic Warmaster but A.B. do it very well and that’s the most important thing. As for me I adhere totally. 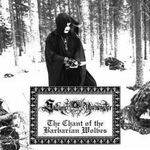 What could I say about the Satanic Warmaster track “The chant of the barbarian wolves” as its just S.W., so Black Metal as its best. Majestic and unique. This band have no rival.